Last Winter, Michael O’Rourke asked me to contribute to a Rhizomes special issue on Karen Barad (list of contributors here). I hesitated for weeks, worried about whether I’d actually be able to do it well. Since my math peaked at pre-Calculus, anything I write about quantum physics is bound to be embarrassing, and the field attracts so many cranks. Given my training, how could I possibly not end up among them? Well, I did it, anyway, and beat the deadline by 24 hours by submitting the essay yesterday. I can only hope I don’t merit a spot on the crank bench next to the Time Cube. I wouldn’t have been able to do this without the Quantum Medievalists and Sundry Associates, a group organized by Angie Bennett Segler, an NYU grad student doing really extraordinary Digital Humanities work on Piers Plowman. 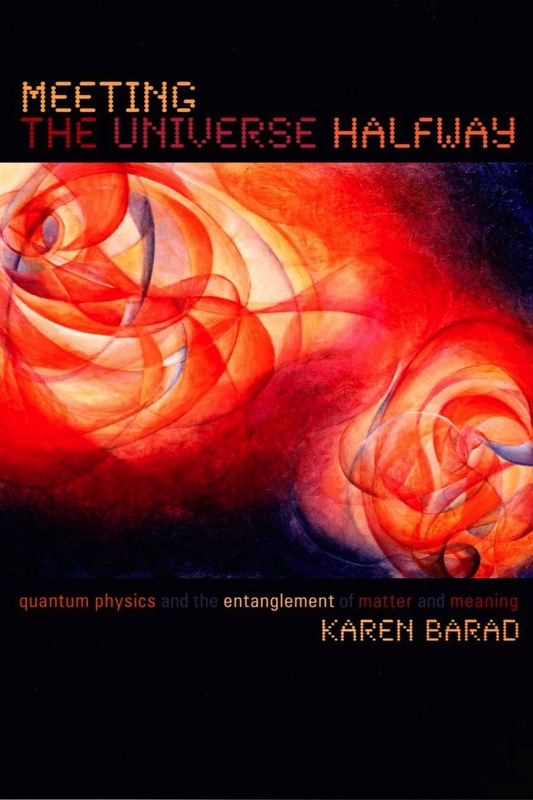 With regular members Shyama Rajendran, Ada Smailbegovic, Ashby Kinch, and especially Brandon Jones and Sandra Danilovic, we made our way, week-by-week, through the 500-odd pages of Barad’s Meeting the Universe Halfway, meeting via a Google Hangout every Wednesday to work out and in our confusion, hesitation, and enthusiasm. There were charts; there was math; there were internet outages; but we endured and we read the whole thing. We finished today, with 3 participants in various locations in New York, 1 in Illinois (? ), and another in sunny Macedonia, on a street full of ironic (?) neo-Classical architecture. Though Barad remains undercited by the object-oriented ontologists, quantum mechanics is already being successfully colonized (?) engaged with (?) by the new materialists, especially by Stacy Alaimo’s Bodily Natures, Vicki Kirby’s Quantum Anthropologies, and most recently, by Timothy Morton. Žižek’s Less Than Nothing gets it on the action, too, with its own chapter devoted to Bohr and Barad. It’s no wonder: any thoroughgoing disanthropocentric materialist has to rethink terms like nature, identity, cause, effect, representation, and agency, and the weird temporality of quantum mechanics offers ample rewards to narrative theorists, as we discuss in the video above. At the same time, I titled my Rhizomes essay “Is a Quantum Mechanics Literary Studies Possible or Desirable?” I’m just not entirely convinced. It’s not that I doubt the truth of Barad or the Bohrian quantum mechanics she champions, but rather that I remain very cautious about its use to people like me. Let’s just say that postmedieval gave me some useful hesitation. This entry was posted in General Culture and tagged digital humanities, new materialism, new materialisms by medievalkarl. Bookmark the permalink.